Multiple Synthetic Reference Material for Monitoring the Analytical Performance of Highly Complex Variant Detection of Cystic Fibrosis Transmembrane Conductance Regulator (CFTR) using Next Generation Sequencing. This poster was presented at the November 2018, Association of Molecular Pathology Annual Meeting held in San Antonio, TX (USA). 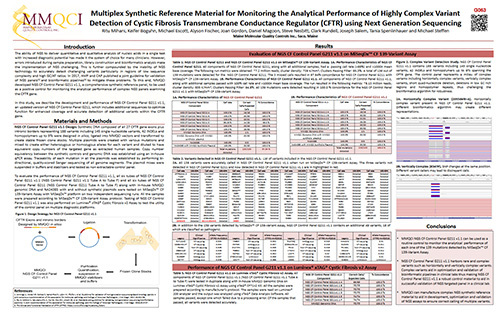 The poster details the development and performance of our new NGS CF Control Panel G211 v1.1, an updated version of NGS CF Control Panel G211, which includes additional sequences to optimize function for enhanced coverage and accurate detection of 188 variants present in the CFTR gene. Development of synthetic secondary standards for BCR-ABL1 quantification on GeneXpert® BCR-ABL Monitor V2 and Xpert® BCR-ABL Ultra assays. 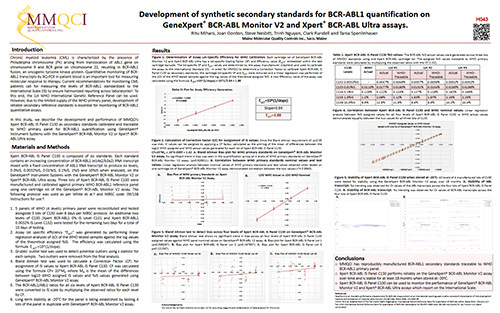 Presented at the November 2018, Association of Molecular Pathology Annual Meeting held in San Antonio, TX (USA), this poster reviews the development of Xpert BCR-ABL IS Panel C130 for use as a reference material to monitor the performance of the in vitro quantitative detection of the BCR-ABL1 translocation mRNA e13a2/b2a2 or e14a2/b3a2 transcripts and the ABL1 endogenous control mRNA transcript when analyzed using the GeneXpert® BCR-ABL V2 assay, or the Xpert® BCR-ABL Ultra assay on the Cepheid GeneXpert® Instrument Systems.